Quail are smaller than grouse. Sexes alike or unlike. FOOD: Insects, seeds, buds, berries. RANGE: Nearly worldwide. 10 in. (25 cm). A small, plump, grayish, chickenlike bird, with a short black plume curving forward from crown. Male has black-and-white face and throat, scaled belly pattern. Female duller. voice: Three-syllable qua-quergo, or Chi-cago. Also light clucking and sharp pit notes. Male on territory, a loud kurr. 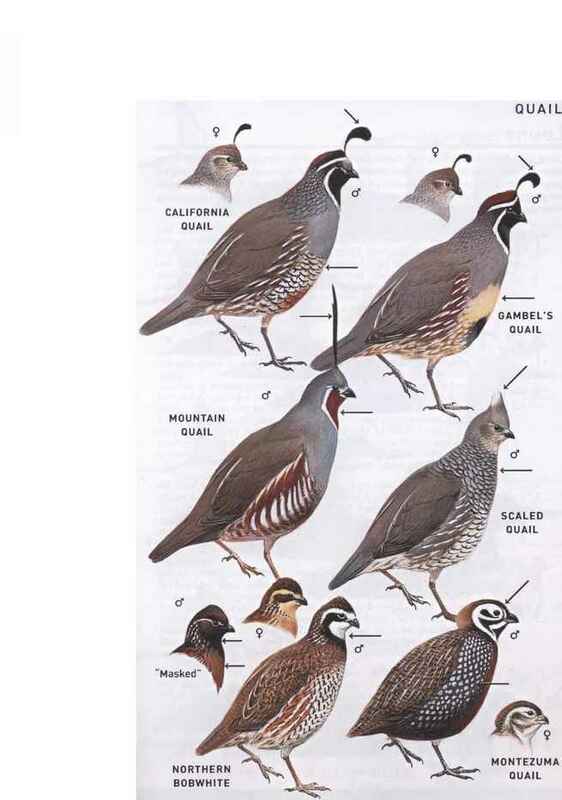 similar species: Gambcl's Quail has rufous brown crown, different belly pattern; ranges barely overlap. habitat: Broken chaparral, woodland edges, coastal scrub, parks, estates, farms. IO'/2-ll in. (26-28 cm). Replaces California Quail in most desert habitats. Similar to that species, but male Gambel's has black patch on light, unsealed belly; flanks and crown more russet (a local name is "Redhead"). Female also unsealed on belly. voice: Loud kaaaa; also ka-KAA-ka-ka and sharp ut, ut notes. habitat: Variety of shrubby desert environments, including parks, suburbs. 11 in. (28 cm). A gray-and-brown quail of mountains. Distinguished from California Quail by long straight head plume and chestnut (not black) throat. Note chestnut-and-white side pattern. Female similar to male but duller, with shorter plume, voice: Mellow wook?or to-wook?repeated at intervals by male; loquacious nw-M'tnv-wew-wew series. habitat: Open pine and mixed forests, brushy ravines, montane chaparral. 10 in. (25 cm). A pale grayish quail (sometimes called "Blue Quail") of arid country, with scaly markings on breast and back. Note short bushy white crest, or "cotton top," a common nickname for this species. Runs; often reluctant to fly. voice: Guinea hen-like che-kar (also interpreted as pay-cos). habitat: Shrub-grasslands, brush, arid country. 9'/2-10 in. (24—26 cm). A small, rotund fowl, near size of a meadowlark. Ruddy, barred and striped, with short dark tail. 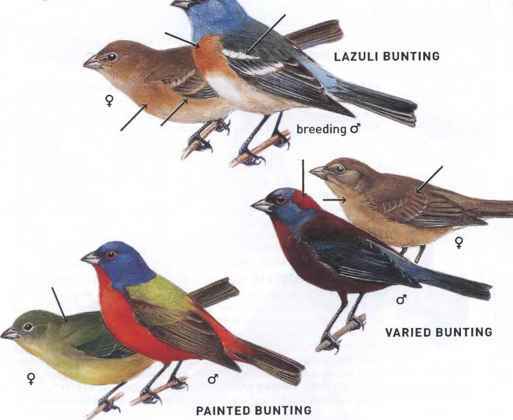 Male has conspicuous white throat and white eyebrow stripe; in female these are buff. A dark Mexican subspecies, "Masked" Bobwhite, with black throat and rusty underpays, was once found in s. AZ, where it has been locally reintroduced. voice: Clearly whistled Bob-white! or poor, Bob-whoit! Covey call ko-loi-kee? answered by whoil-kee! similar species: Ruffed Grouse larger with fanlike tail, habitat: Farms, brushy open country, fencerows, roadsides, open woodlands. Recent hunting releases fairly widespread. 8Vi-9 in. (21-23 cm). A rotund quail of Mexican mountains and canyons. Note male's oddly striped clown's face, bushy crest on nape, and spotted sides. Female brown, with less obvious facial striping. Tame (sometimes called "Fool's Quail"). voice: Male gives a descending whistle; a soft whinnying or quavering cry; ventriloquial. habitat: Grassy oak canyons, wooded mountain slopes with bunch grass. 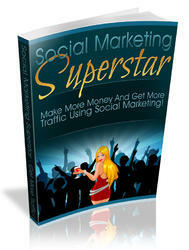 Discover exactly how you can exploit the popularity of Twitter to instantly fill up your mailing list with fresh prospects that are eager to purchase your products or affiliate products that you promote!. Twitter is one of the easiest ways to create an online presence and secure your market share quickly. Plus learn much more.